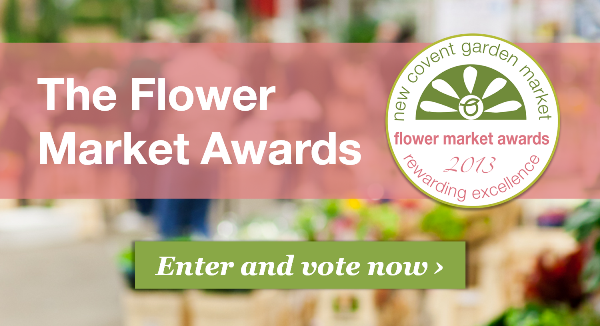 Entries are now open online for the first ever Flower Market Awards to customers and wholesalers of New Covent Garden Flower Market. Three major awards are up for grabs: Florist of the Year, Plantpeople of the Year and Wholesaler of the Year. The winners stand to receive the Flower Market Awards trophy, online business profiles on our website and our media partners, plus the choice of the new iPad with Retina Display (16GB) or a commercial photoshoot worth over £400. "Launching the Flower Market Awards gives us an exciting opportunity to publicly recognise and celebrate the dedication and achievements of people involved with New Covent Garden Flower Market," says Helen Evans, Head of Business Development at Covent Garden Market Authority. The Florist & Plantpeople of the Year awards are open to all customers of New Covent Garden Flower Market (size does not matter!) and you can find out more information and enter your business here. The judges of Wholesaler of the Year are you – the customers of the Flower Market! Vote online here and tell us who you judge to be the pick of the crop. Entries and votes close for all awards on Friday 18 October 2013. Winners and shortlisted entries will be revealed in the week beginning Monday 18 November 2013.